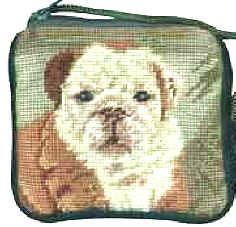 Bulldog Needlepoint Pillows! Bulldog Shoulder Bags! 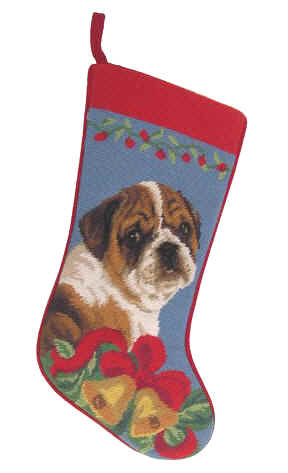 Elegant Dog Breed Gifts, including English Bulldog Merchandise and Gift Items. The Ultimate Shopping Mall for Dog Owners and Bulldog Lovers. 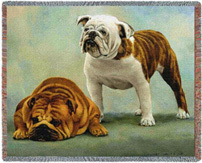 Bulldog Tapestry Throw. Blanket, or Afghan: "I Said I Was Sorry"
C L E A R A N C E !!! Almost gone - ORDER NOW! For the true English Bulldog lovers, here is our high-quality fabric "Bullie Handbag", featuring a cute pair of English Bulldogs. Every bag is individually handcrafted by our own "Kissed By Dogs" professionals.